Passed away peacefully after an illness at Rockingham General Hospital on 4.4.2019 aged 73 years. 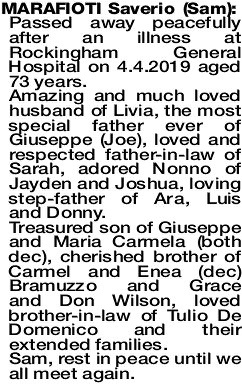 Amazing and much loved husband of Livia, the most special father ever of Giuseppe (Joe), loved and respected father-in-law of Sarah, adored Nonno of Jayden and Joshua, loving step-father of Ara, Luis and Donny. 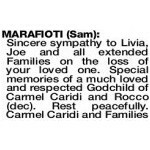 Treasured son of Giuseppe and Maria Carmela (both dec), cherished brother of Carmel and Enea (dec) Bramuzzo and Grace and Don Wilson, loved brother-in-law of Tulio De Domenico and their extended families. 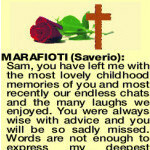 Sam, rest in peace until we all meet again. 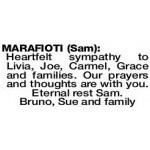 The Funeral Mass for Mr Saverio (Sam) Marafioti of Burswood, formerly of North Bodallin, will be celebrated in Aquinas College Chapel, 58 Mt Henry Road, Salter Point commencing at 11:00 AM MONDAY (15.04.2019). The cortege will leave the church at the conclusion of Mass and arrive at the main entrance of KARRAKATTA Cemetery, Railway Road, Karrakatta at 1:00 PM for a Cremation Service. Vigil Prayers and Rosary will be recited in Aquinas College Chapel, 58 Mt Henry Road, Salter Point at 3:00 PM on SUNDAY (14.04.2019). 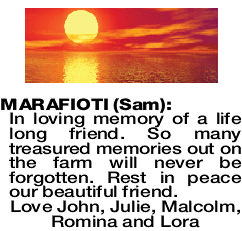 Donations in lieu of flowers to Rockingham General Hospital Donation Account, Elanora Drive, Cooloongup, WA 6168 in Sam's memory would be appreciated. Rest in peace dear Sam, leaving amazing memories of much love, laughter, music, kindness and ever vigilance of your harmless pranks and card games. Your memory will always be in my heart for the legacy you left - to give is to get. 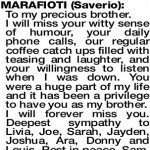 MARAFIOTI SAVERIO To my precious brother. I will miss your witty sense of humour, your daily phone calls, our regular coffee catch ups filled with teasing and laughter, and your willingness to listen when I was down. You were a huge part of my life and it has been a privilege to have you as my brother. I will forever miss you. 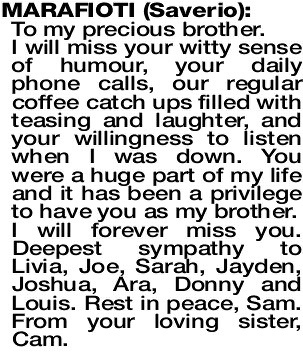 Deepest sympathy to Livia, Joe, Sarah, Jayden, Joshua, Ara, Donny and Louis. Rest in peace, Sam. From your loving sister, Cam. 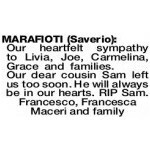 MARAFIOTI SAVERIO Heartfelt condolences to Livia, Joe, Carmela, Grazia and all families on the sad passing of Sam. Fond memories always. 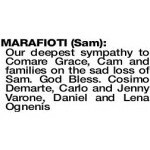 From Zia Angela and Cousin Nicky Marafioti. RIP Sam. MARAFIOTI SAVERIO Sam, you have left me with the most lovely childhood memories of you and most recently our endless chats and the many laughs we enjoyed. You were always wise with advice and you will be so sadly missed. Words are not enough to express my deepest sympathy to Livia, Joe, Cam, Gracie and all families. 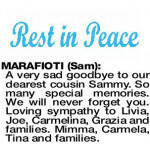 Ciao Sam, RIP. 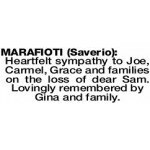 From your cousins Mimi, Sam, Michael and Brooke Agostino and Natalie and Anthony Macri and families. 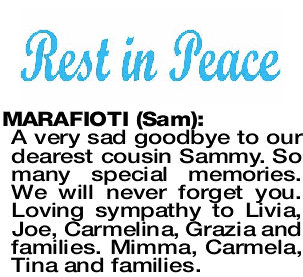 A very sad goodbye to our dearest cousin Sammy. So many special memories. We will never forget you. 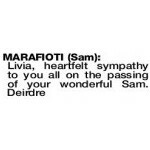 Loving sympathy to Livia, Joe, Carmelina, Grazia and families. Mimma, Carmela, Tina and families. 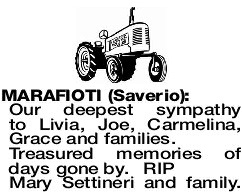 MARAFIOTI SAVERIO It breaks our heart to see you go, but we will always cherish the memories and laughs we shared. We were privileged to have had you as our uncle and great uncle, you were one in a million. Thank you for your love, support and always being there for us. You will be forever missed. 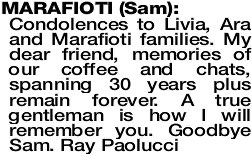 Our Condolences to Livia, Joe and families. Love Annette, Tony, Michael and families. 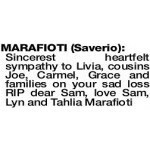 Our deepest sympathy to Livia, Joe, Sarah, Cam, Gracie, Don and families. Remembering our holidays card nights and our weekends away with the boys on the farm. Your cheeky antics will be with us forever. You are with your cousin Sam no doubt having fun. Anna, Bruno, Leo, Antie and families. 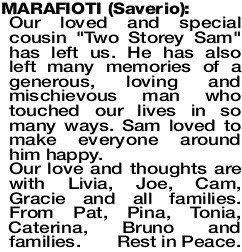 Our loved and special cousin "Two Storey Sam" has left us. He has also left many memories of a generous, loving and mischievous man who touched our lives in so many ways. Sam loved to make everyone around him happy. 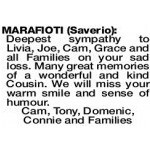 Our love and thoughts are with Livia, Joe, Cam, Gracie and all families. 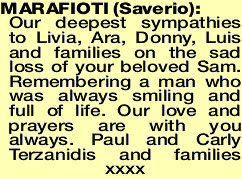 From Pat, Pina, Tonia, Caterina, Bruno and families. Rest in Peace. 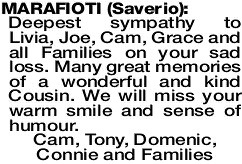 Our heartfelt sympathy to Livia, Joe, Carmelina, Grace and families. Much loved brother of Grazia and brother-in-law to Don. 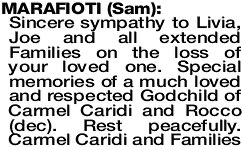 Sam was a very kind and loving person throughout his life and on this journey touched many people who are richer for it. Words cannot express how much you were loved or how much you will be missed. Our memories of you and the happy times we all shared will last with us forever. 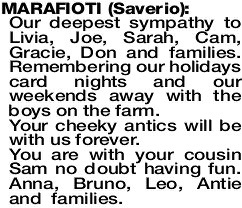 Our deepest sympathy to Livia and Joe and families. 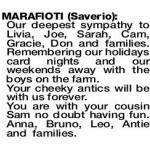 MARAFIOTI SAVERIO Our loving uncle. You left ground and sky weeping, mind and soul full of grief. No one can take your place in existence, or in absence. Both mourn, the angels, the prophets, and this sadness we feel has taken from us the taste of language, so that we cannot say the flavour of us being apart (Rumi). 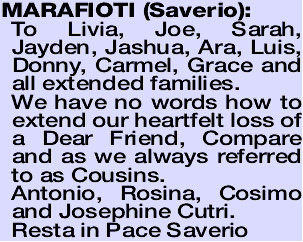 Our heartfelt condolences to Livia, Joe, Sarah, Jayden, Joshua, Ara, Donny and Luis. We will miss you. Your loving nieces, Diane and Dee. 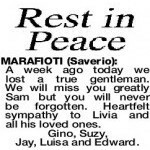 MARAFIOTI SAVERIO Treasured memories of our Uncle Sam. Our thoughts are with Livia, Joe and families. Love Emma, Carly, Izaac and family. A week ago today we lost a true gentleman. We will miss you greatly Sam but you will never be forgotten. 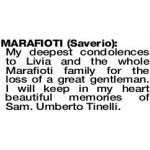 Heartfelt sympathy to Livia and all his loved ones. Gino, Suzy, Jay, Luisa and Edward. 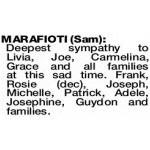 MARAFIOTI SAM Deepest sympathy to Livia, Joe, Carmelina, Grace and all families at this sad time. Frank, Rosie (dec), Joseph, Michelle, Patrick, Adele, Josephine, Guydon and families. 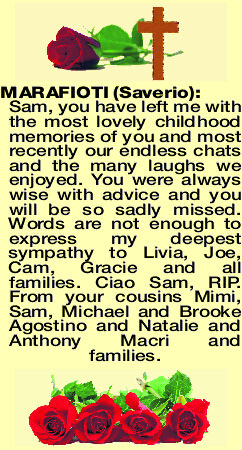 Deepest sympathy to Livia, Joe, Carmelina, Gracie and families on the sad loss of Sam. RIP. 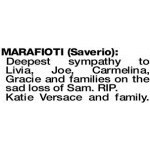 Deepest sympathy to Livia, Joe, Carmelina, Grace and respective families. Our thoughts are with you all. 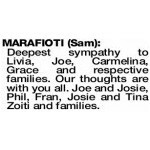 Joe and Josie, Phil, Fran, Josie and Tina Zoiti and families. 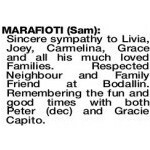 Deepest sympathy to Livia, Joe, Cam, Gracie and Don and families on Sam's passing. Now at peace in God's care. Dominic and Lucy Scutti and family. 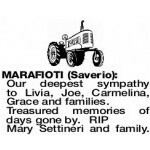 Our deepest sympathy to Livia, Joe, Carmelina, Grace and families. 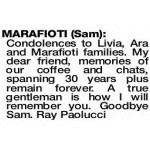 My deepest condolences to Livia and the whole Marafioti family for the loss of a great gentleman. I will keep in my heart beautiful memories of Sam. Umberto Tinelli. 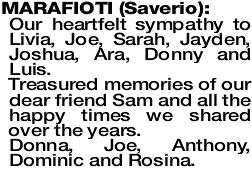 Sincere sympathy to Livia, Joey, Carmelina, Grace and all his much loved Families. Respected Neighbour and Family Friend at Bodallin. Remembering the fun and good times with both Peter (dec) and Gracie Capito. 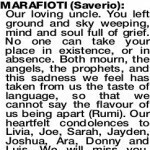 MARAFIOTI SAVERIO Our heartfelt sympathy to Livia, Joe, Sarah, Jayden, Joshua, Ara, Donny and Luis. Treasured memories of our dear friend Sam and all the happy times we shared over the years. Donna, Joe, Anthony, Dominic and Rosina. 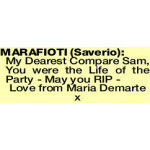 MARAFIOTI SAM In loving memory of a life long friend. So many treasured memories out on the farm will never be forgotten. Rest in peace our beautiful friend. 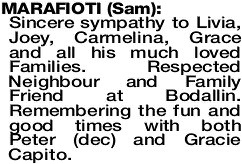 Heartfelt sympathy to Joe, Carmel, Grace and families on the loss of dear Sam. 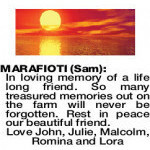 Lovingly remembered by Gina and family. 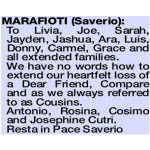 MARAFIOTI SAVERIO To Livia, Joe, Sarah, Jayden, Jashua, Ara, Luis, Donny, Carmel, Grace and all extended families. We have no words how to extend our heartfelt loss of a Dear Friend, Compare and as we always referred to as Cousins. Antonio, Rosina, Cosimo and Josephine Cutri. 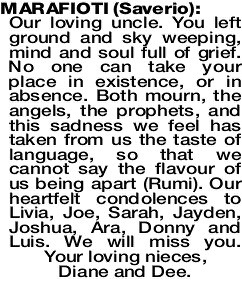 Our heartfelt sympathy to Livia, Joe and family for your loss. 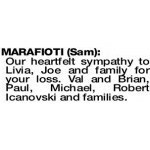 Val and Brian, Paul, Michael, Robert Icanovski and families. 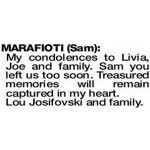 My condolences to Livia, Joe and family. Sam you left us too soon. Treasured memories will remain captured in my heart.